To: Mr A Grewe/The Legal Occupier Ooops? Do they think there might be an illegal occupier here? Note to self: Better check my tenancy agreement. 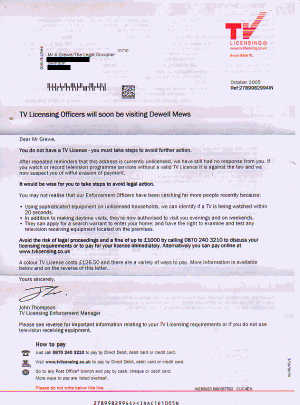 TV Licensing Officers will soon be visiting Dewell Mews Ah, that's good to know. We'll make sure everything is clean and tidy and that there will be space for them to park. I assume they will come by car? You do not have a TV License - you must take steps to avoid further action. Part 1, yes, I know. Haven't had a TV License since 1998. Part 2, must I? After repeated reminders that this address is currently unlicensed, we have still had no response from you. Well, why do you remind me of a fact I'm aware of since 2003? And where is the pre-paid envelope you promised me earlier? It would be wise for you to take steps to avoid legal action. Oh? Yes, you're probably right. Avoiding legal action is probably a good idea. Wouldn't want that, do we? Using sophisticated equipment on unlicensed households, we can identify if a TV is being watched within 20 seconds. That sounds fascinating. Does it have lots of blinking LEDs and rotating aerials and stuff? Can I it? That would be soooo cool! In addition to making daytime visits, they're now authorised to visit you evenings and on weekends. Yes, thinking about it, that's probably a good idea. Very customer service oriented, aren't you? Wouldn't want all those hard working singles miss out on your visits! They can apply for a search warrant to enter your home; and have the right to examine and test any television receiving equipment located on the premises. Wow. Do they do dawn raids as well? Like you see in the movies, people jumping out cars, shouting 'go go go go', smashing in doors and things? No? But they do wear these surgeon gloves when examining the evidence? Avoid the risk of legal proceedings and a fine of up to £1000 by calling 0870 240 3210... What? I'm not even paying for a TV Licence and you expect me to call an 0870 number? You must be joking! ...to discuss your licensing requirements or to pay for your licence immediately. I don't know. I don't think I have any requirements, I'm happy as it is. What is there to discuss?